We have introduced Point System to Unlock Content. This system is used to hide Content from Guest as well as Members. To unlock Content you need points. 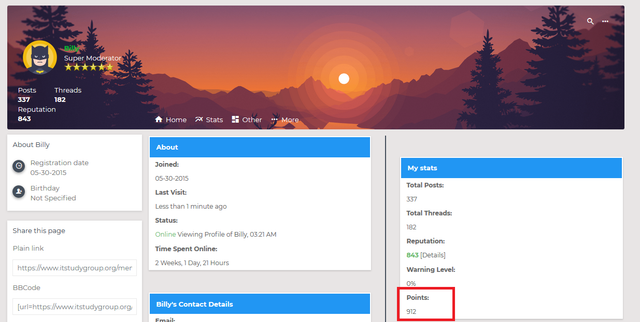 You Can Earn Points by posting New thread = 5 Points. or You can also Purchase Points and use those points to unlock content. If you see any post content below box that means you need points to unlock contents. For example you have 20 points in your account and you want to unlock those contents. The thread poster set 10 points need to unlock contents. When you click to unlock contents button then 10 points will be get deducted from your account. After this contents will get unlocked. How I can check my Point Balances ? If you want to check your balances you need to go Profile From Menu after this you will see your point balances as below. Currently we have introduced three plan for Points as below. You can Purchase Points those points and use those points to unlock content. This post was last modified: 01-06-2019, 04:56 PM by billy.